Climate change has been the term adopted instead of the once abundant phrase “global warming” to describe the anthropogenic changes to our world and the results of such a shift. The substitution happened in part because although global temperature is increasing, there are other far more pressing and immediate effects that human pollution is causing, and the focus should perhaps be shifted away from simply temperature increase, and towards more disturbing concerns. 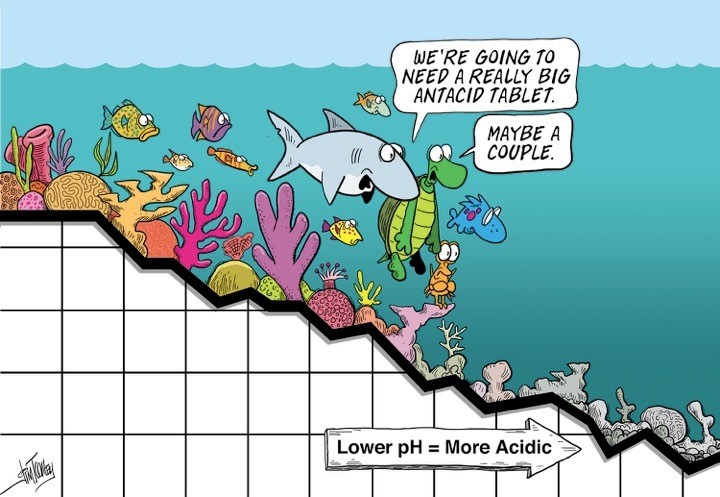 So – let’s talk about Ocean Acidification. In the past 50 years the oceans have absorbed between 24 and 33% of anthropogenic carbon dioxide emissions. They act as a huge carbon sink, sucking up lots of carbon dioxide that would have been released to the atmosphere. While at first this high absorption rate seems advantageous in moderating the rate and severity of climate change effects, the high input level of CO2 forms carbonic acid and lowers the pH of water, having adverse chemical effects in ocean habitats. Ocean acidification and global warming stem from the same source – the burning of fossil fuels and excess release of carbon therein – but are wildly different problems. These changes are particularly threatening for calcifying sea creatures or shelled organisms that use carbonate and calcium to build shells and skeletons. The economic costs of ocean acidification have not yet been fully adequately researched or included in estimates of the social cost of carbon (SCC), a dollar measure of the long term damage done by a ton of CO2 emissions in a given year. Below I have inserted a table from a study by Talberth and Niemi which shows the plausible worst-case scenarios and values at risk from ocean acidification and warming. Their preliminary results from the study suggested that overall SCC will be raised 1.5-4.7 times higher than the current federal rate when accounting for ocean acidification. The Third Symposium on the Ocean in a High-CO2 World reported several statements about ocean acidification in varying ranges of confidence. Socio-economic impacts are discussed at the medium confidence level, expecting economic damage that results from impacts to coral reefs, tourism, food, and shoreline protection. Just how big a cost is uncertain, but was estimated in the report at somewhere around $1 trillion for coral reef loss alone. In an article by Cherie Winner, oceanographer Sarah Cooley states that while it’s hard to put a dollar value on the benefits provided by coral reefs, that value is undoubtedly very high. The worldwide value of shoreline protection by reefs estimated at about $9 billion/year, and hat plus reef-supported fisheries evened out to about $30 billion/year. The same study revealed that in 2006 the Caribbean island of Tobago accounted for 30% of GDP from coral reef tourism, 1/2 of which was indirect income in the form of money spent on land by tourists, and the other half from direct income in visits. Economic impacts for commercial fisheries and the industries associated within are much easier to tangibly quantify. Sarah Cooley’s own research found that the first direct impact on humans will be through declining revenues from shellfish, their predators, and all coral reef habitants. 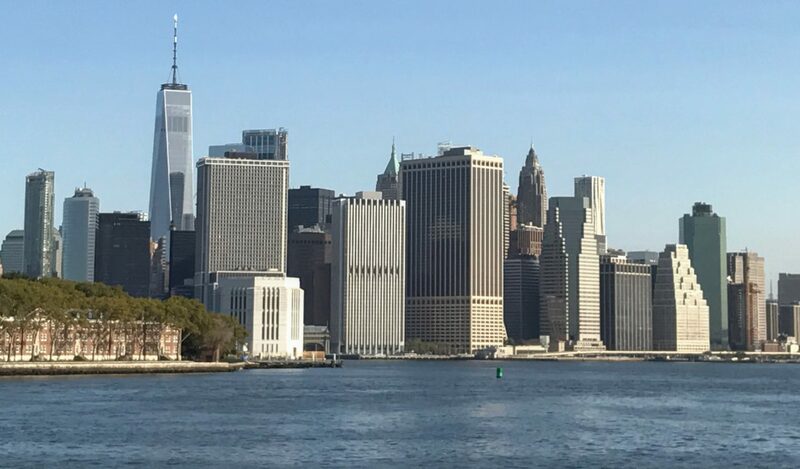 Their study states that in 2007 the $3.8 billion annual domestic ex-vessel commercial harvest contributed $24 billion to US gross national product, 19% of which ($748 million) was mollusks alone – the primary focus of their acidification research. They also focused on economic losses from harmful algal blooms, another colorful result of ocean acidification and warming, which cost the US about $12 million annually by causing sickness in both fish and humans, habitat loss, and lower tourism. The only true mitigation strategy for ocean acidification is the same carbon elephant in the room with all discussions on climate change – limiting and eventually halting the use of fossil fuels to address the CO2 emissions in the atmosphere. Because ocean acidification and climate change at large operate on longer timescales than humans do in their day to day lives, we are often able to sustain the illusion that it is a problem we will simply be able to deal with later. Ocean acidification will drive biological changes over about 50 years and economic effects will compound over time. Despite the small up front costs, reducing CO2 emissions over the next few decades is the only way to provide noticeable economic benefits over the coming generations.